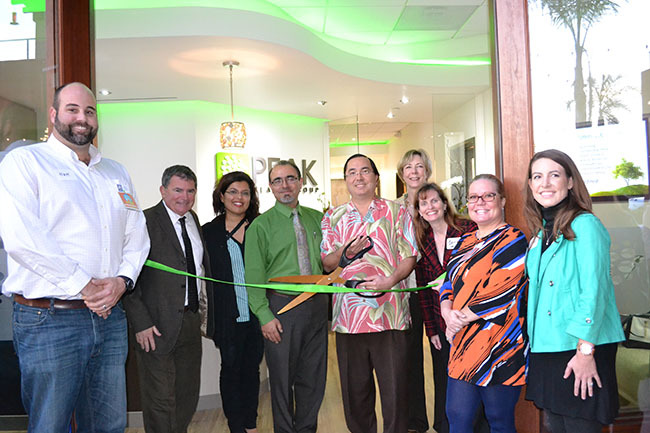 When Dr. Patrick Yassini and his medical associates planned a grand opening for the new Peak Health Group office, they thought it made sense to hold it in January. After all, right after the new year is when people are most geared up to adapt new habits, especially those suited for adopting a healthier lifestyle! But the good doctor and his staff didn’t anticipate the fury that Mother Nature would unleash during early January. Although they planned to bring in tents for the patio, two days before the event, torrential rains and fierce winds flooded the patio… and soon water was creeping under the office door and down the hall. A call was made to the Coronado Fire Department, sand bags were were deployed and the beautiful new office interiors were saved. But the party had to be canceled. But happier days and friendlier skies prevailed when “Take Two” of the grand opening and ribbon cutting took place on Feb. 18. Guests enjoyed catering from neighboring restaurant, Gustatory, drawings for cosmetic services such as Botox treatments and products from Allergan, Merz Aesthetic, SkinMedica, Metagenics and Designs for Health. 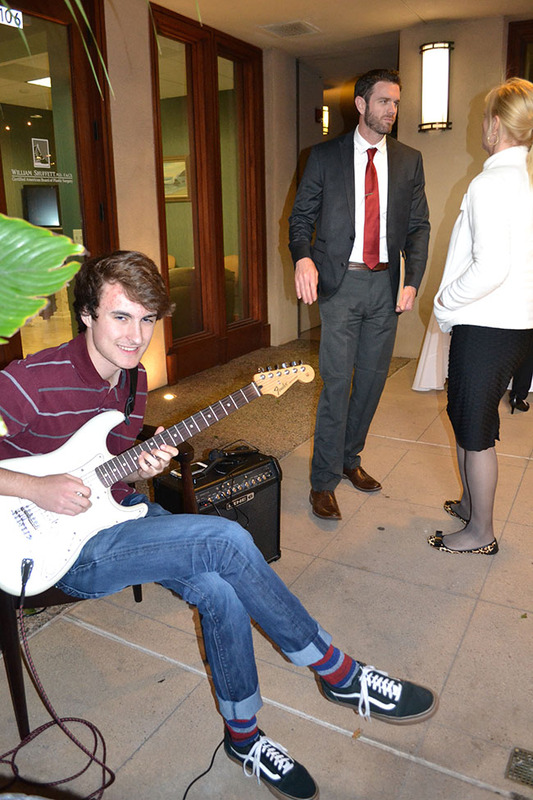 As guests toured the new offices (at Coronado City Views, 131 Orange Ave., immediately north of Boney’s Bayside Market), Juice Crafters provided samples of their cold-pressed juices, Jan Bardot gave chair massages and Coronado High School’s Max Perryman played guitar. Dr. Yassini, board certified in family medicine, integrative and holistic medicine and fellowship-trained in metabolic, anti-aging and regenerative medicine, explained that his consultation room is equipped with comfortable chairs where he can converse side-by-side with patients about their health-care needs. “There’s not an imposing desk dividing the space,” Yassini explained. “I want my patients to understand that we are partners in their quest for peak health.” His private office is connected to an exam room, and three additional offices provide spaces for nutritionists and procedures. A lab allows in-house blood draws. Peak Health Group (peakhealthgroup.com) offers a direct practice model, where patients have a direct relationship with their doctor, including nights and weekends (and house calls, if necessary) for a nominal annual fee. Chamber of Commerce members and City Council representatives help cut the ribbon on Peak Health Group’s grand opening. From left, Matt Pontes, City Councilman Bill Sandke, Katee Yassini Afshar, DDS, Patrick Yassini, MD, Mayor Casey Tanaka, Sue Gillingham, City Councilwoman Carrie Downey, Suzanne Lewis, Megan Pontes. Bill Sandke enjoys a chair massage, courtesy of Jan Bardot.